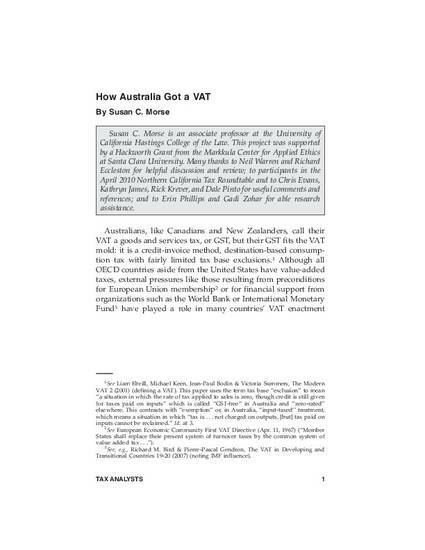 Australia got its goods and services tax – its VAT -- in 2000. It enacted GST legislation through ordinary political channels, without external pressure from a multinational organization, without the pressure of an extreme national fiscal crisis and without an unusual exercise of executive authority. And the GST-enacting center-right Liberal-National Party government retained control for seven years after the reform. This paper tells the Australian story in four parts: (1) framing the GST as a relatively efficient tax; (2) building a coalition between business and social welfare interest groups; (3) emphasizing efficiency while addressing regressivity in the political and legislative process; and (4) the federalism solution included in the reform, which provided for the transfer of GST revenue to the Australian states and territories.